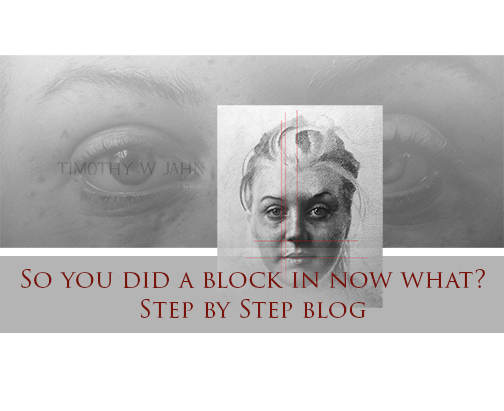 So you did a block in now what? 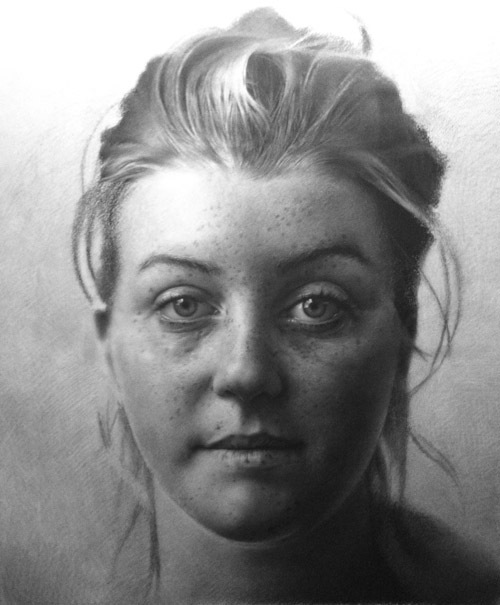 Many artists are taught to develop their drawings and paintings using a block-in. This is a very common phrase in art classes and sometimes it can have different meanings; much like many other art terms. In this post I am defining block-in as; simplification of the pattern of light interacting with form. For this drawing I started out with a simple line drawing, then I built the overall forms and values on top, thus ending with, what I am defining as, my block-in. Why do we block-in? For some of us it’s because we want to look at our object from the outside in. There are different uses for it; some teachers use it to help students with proportion, scale and placement. The reason I used it in this drawing was to allow me to look at the overall form conceptually, which allowed me to leave clues on the surface of the drawing of some morphology of the model. So let’s say you have a block-in you like and you want to develop your drawing further. 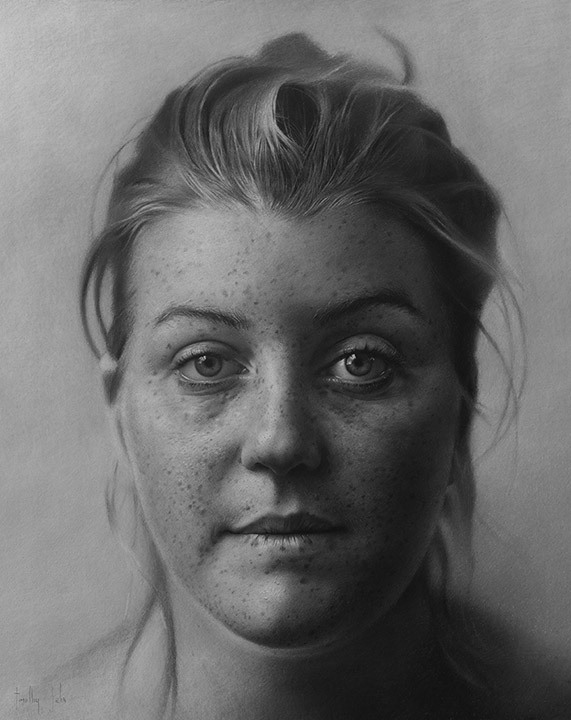 The first thing is to have a clear idea of what the focal point of the drawing will be. Most likely you will already have this in mind but as you start the next steps of the drawing everything will build out of your focal point. As we are now looking at our object from the inside out.This stage of the drawing could also be described as drawing observationally, as we will begin to make very decisive notations of all the halftone values on the form. 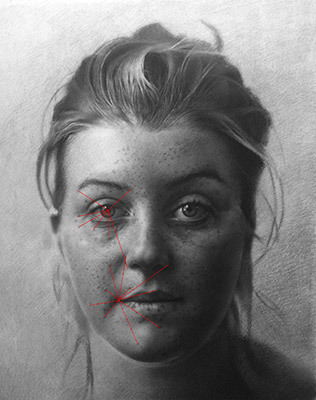 Every drawing presents a unique set of challenges to complete. While each picture has new problems, we don’t have to completely reinvent our working method every time we start. Be sure to use vertical and horizontal plum lines to line up the exact placement of your focal points on your block-in (Illustration A). If you were careful with your block-in, you would have been mindful of where your highlights would be falling. As you are progressing into a finished stage your full value range needs to be established. 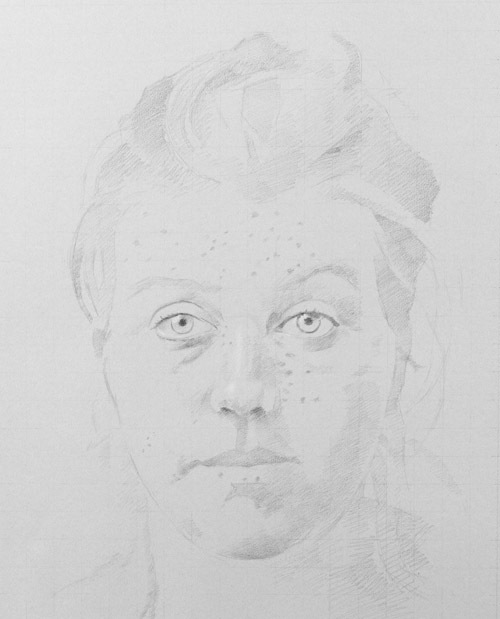 This stage of the drawing could also be described as drawing observationally, as we will begin to make very decisive notations of all the halftone values on the form. As you begin to develop your focal point, your ability to get a clear conception of the interaction of the edges of the forms you’re working on will have a massive impact on the illusion of the object. 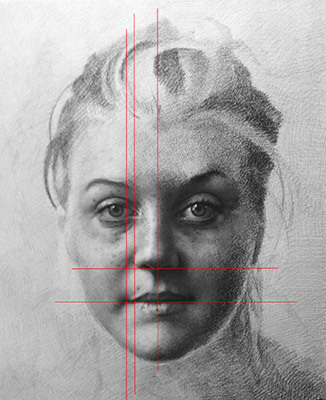 Try to identify the sharpest and softest edges in the drawing and place the edge you’re working on in accordance. Each form needs to be carefully considered in its relationship to the light. 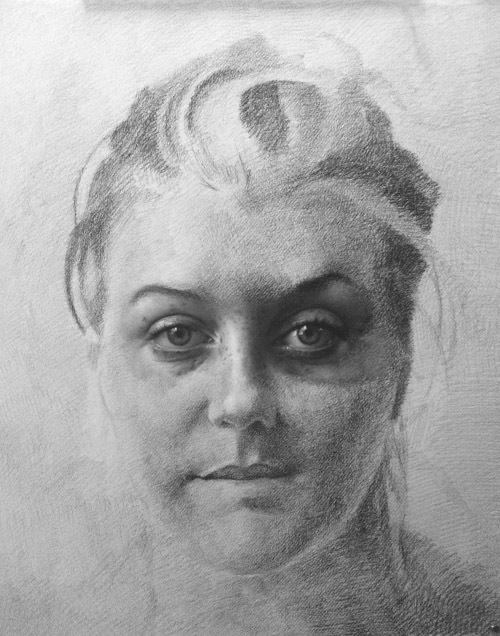 As we move through this stage of the drawing there is no need to rush. This is a common thing I see when I am teaching. Carefully make a clear and distinct statement about each form you are dealing with. The rest of the drawing will build out the same way. There are times when you are working that you may find it beneficial to go back to thinking about your forms conceptually, i.e. the head simplified sphere, the nose and ear as a rounded wedge. This can be very useful and can really make the overall image look much more convincing. You can ask yourself “where would the egg shape skull be sitting in relationship of the light? How well did you represent the symmetry of the cheek bones? Depending on your knowledge of anatomy and your understanding of human morphology, you can create a series of questions that help develop your aesthetic. I hope this info was helpful to you and I wish you the best of luck on all of your future artist endeavors. Drawing is laid out in a simple contour line. After developing a block-in the focal points were carefully established. Building out from focal points the values were carefully refined. Remember to be conscious of the overall forms as the smaller subdivisions come into focus. As the refinement develops the texture becomes much more refined. Be sure the texture follows the form and stays in the proper relationship to the light. As you reach the final assessments of the drawing be sure that the background and the foreground are interacting together and that the edges work with the overall conception of the piece.